Médecins Sans Frontières, the worldwide charity, wanted a new way to get their message through to a unique target audience – marathon runners seeking charities to fundraise for. I came up with this comic strip campaign postcard. 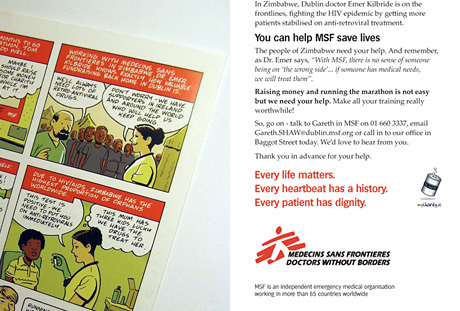 On one side, there was a story outlining the committed work of the MSF team in war-torn countries. On the other, there was a more traditional copywriting approach making the appeal. In the demanding and competitive fundraising sector, this campaign really stood out with the help of one of Dublin’s leading illustrators, Philip Barrett. See full sample here.